There’s so much awesome in Mad Max: Fury Road, the notion of making a poster for it seems daunting. Unless, of course, you put all of it together in one crazy poster, which is what artist Scott C did. 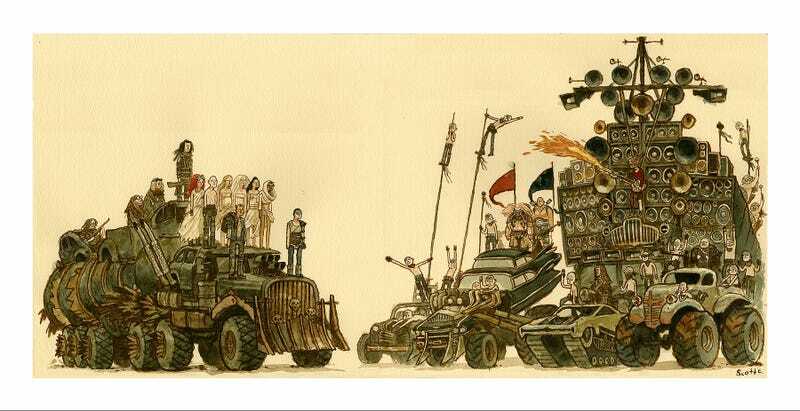 His Mad Max poster, “A Lovely Day,” is now on sale now, through August 7. Here’s the link. Just look at that thing. It’s the visual representation of the word “Epic.” And you don’t have to worry about it selling out. It’s being released in a timed edition—which means that as many prints they sell through August 7 at 9pm PST, that’s how many they’ll print. It’s an archival giclee print, 12 inches by 24 inches, and will come signed by the artist. If you like the style here, you’ve got to check out more of the artist’s work. This piece is part of a much larger series by Scott C called The Great Showdowns. In the series, which he’s been doing for years, he represents movies from all decades, genres and more in a similar stare-down fashion. It’s spawned multiple solo art shows, books and more. And though he’s been doing this for years, I think the Showdown for Mad Max: Fury Road might be the most impressive yet.